Sunday Polo parking is complimentary. Parking attendants are onsite to guide traffic to the appropriate parking areas. 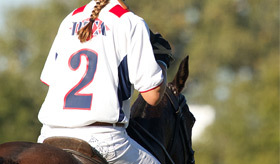 HPC employees are onsite to direct guests to Polo and Event areas. Member Guests, Box the Day, park then take our HPC golf cart shuttles to the Grandstand side of the field. Law prohibits alcohol beverages, non-alcohol beverages or food to be brought into the club. The club’s official concession, Ruth’s Chris, serves delicious culinary delights and a variety of beverage and spirits. For men collar shirts are required, pair with nice shorts or casual pants. For the ladies, sundresses, skirts or capri pants. We also recommend flats or wedges if you are wearing heels. You will be walking on turf, gravel and other natural surfaces that can damage thin heels. Please respect the advice of our security personnel regarding parking and crossing of the fields. The safety of all our guests and players is in their best interest. Horses boarded on HPC property are privately owned, touching or petting is prohibited. Outside pets such as dogs are not allowed. Service dogs are welcome. The public is invited to shop at our new HPC Tackeria Tack Shoppe featuring the best tack brands from our Wellington partner Tackeria. The Shoppe offers tack, apparel, mallets, boots and much more. It is a must stop when attending a polo match! Click here to shop.